We guarantee our CarbWorks Service! You simply remove and ship your carbs, then receive, install, ride and enjoy. With Stage 3 Setups we consistently experience 36% increase in performance over stock performance while typically experiencing 38-40 mpg based on your right wrist action! Procedure: Place your order, remove your carbs leaving them bolted together, drain all fuel, seal in 1 gallon Zip-Lock bag, add generous amounts of packing in box and mail via United States Postal Service (USPS) Priority Mail Flat Rate adding insurance for security. We guarantee all CarbWorks Services. Review: My bike runs awesome, it has a smoother idle and the throttle response is crazy strong. 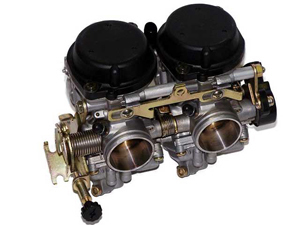 Review: I've had my Carb rebuilt three time before sending them to Gman. found a back up carb set on e-bay sent them in for stage 3 rebuilt. WOW is all I can say. More power!! really nice response, Fast repair and service. I'm getting ready to send in my main set of carb for stage three rebuilt. Do I need two sets of carb.? No But I will..